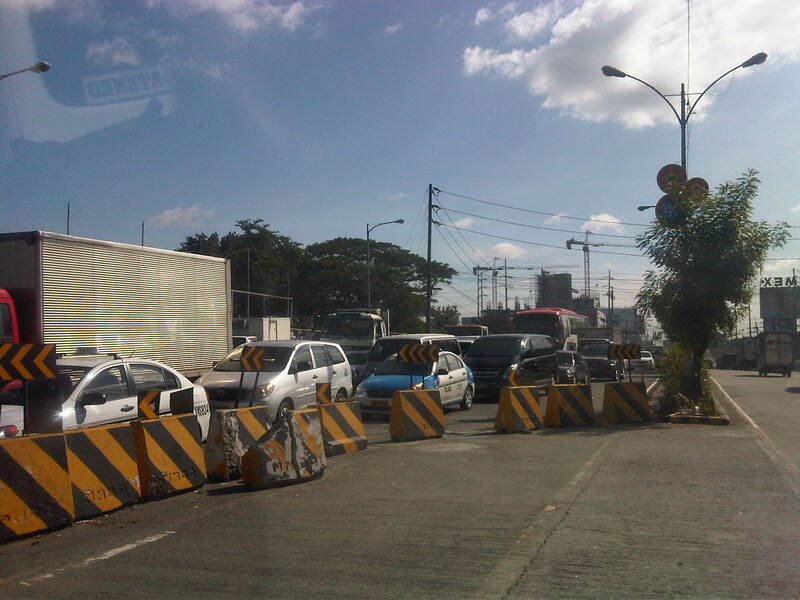 The northbound direction of Katipunan Avenue is usually congested from mid-day to early afternoons on weekdays. The congestion is caused by several factors including truck traffic and school generated traffic. Katipunan is part of a truck route along which trucks are allowed during the perceived off-peak periods (i.e., not during the morning and afternoon peaks). There are many schools in the area including two major universities (UP and Ateneo), a college (Miriam), and several other schools that generate a lot of vehicular traffic around this time mostly from their grade schools or pre-schools. 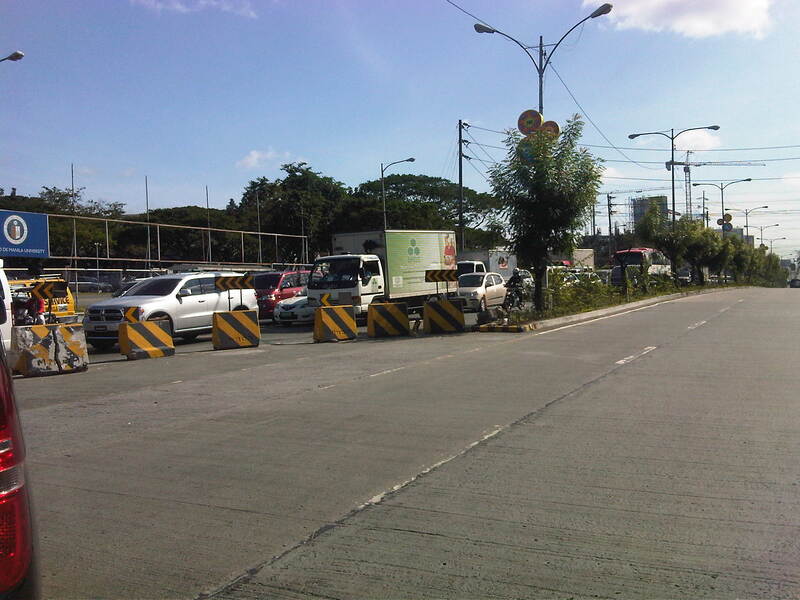 There are also a lot of activity along the stretch from Ateneo to C.P. Garcia due to the commercial establishments especially the restaurants that attract quite a lot of patrons during the extended lunch period (typically from 11:00 AM to 2:00 PM). Congestion stretches onwards and may reach past the other end of the overpass towards the Blue Ridge area. The 5-lane section (3 from the flyover and 2 from the at-grade section) narrows to 3 lanes at this section to accommodate the U-turn slot past Ateneo’s gate 2 – an classic case of a bottleneck. The SM Blue condominium construction is visible in the background of this photo. Although the U-turn slot only has about 1.5 lanes worth of space, the concrete barriers cover the remaining space of a lane, thereby reducing effective capacity for the road section. A tarpaulin sign stating Ateneo’s position questioning Notice the concrete barrier used to delineate the U-turn slot that obviously has seen better days. This location is probably among the most dangerous sections along Katipunan (and C5 in general). This has been site of many fatal road crashes. During early mornings, motorists speeding along Katipunan (uncongested during the unholy hours) and descending the flyover often miscalculate or are suprised by the U-turn slot and its unforgiving barriers. The damage on the barrier in the photo is a “souvenir” of sorts from it being a witness to a crash. 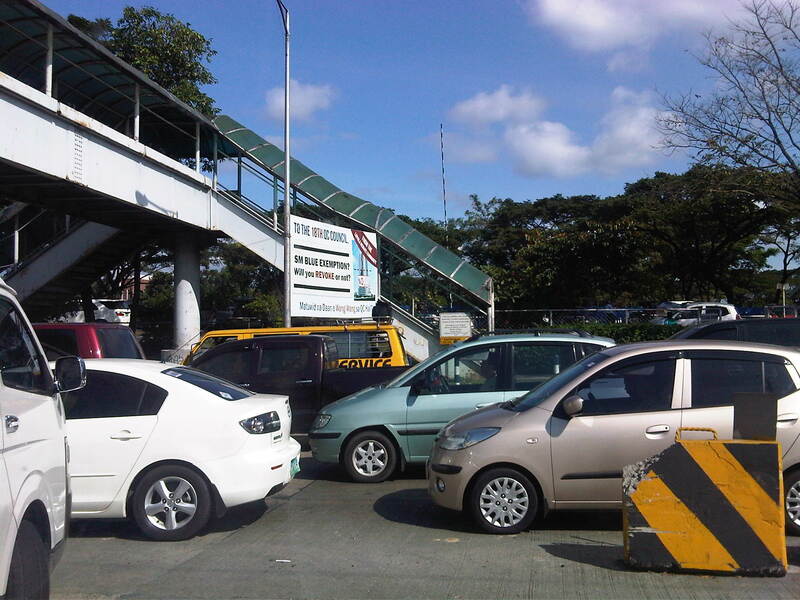 By d0ctrine in Highways and Streets, Traffic Congestion on January 7, 2012 .